The first two are for the current CASE Study. The last week with amazing Debby.. And the last week of CASE Study for the time being. The blog is being suspended. And I’m all like – what challenge will I play along now? This was my absolutely favorite. It’s like the end of an era. Hope it’s not the end and it’ll come back one day. But in any case – these four years were amazing. And it IS amazing how Iwona hosted it for such a log time bringing tons of fun and inspiration. Back to cards 🙂 This time it was very hard to case, just wanted to lift. Because that is Debby and she is a genius. And I’m not 🙂 At least with this card. Already after taking the photo realized I don’t really like the leaves composition. Would change it a bit. The second one supposed to be the first and the only one. 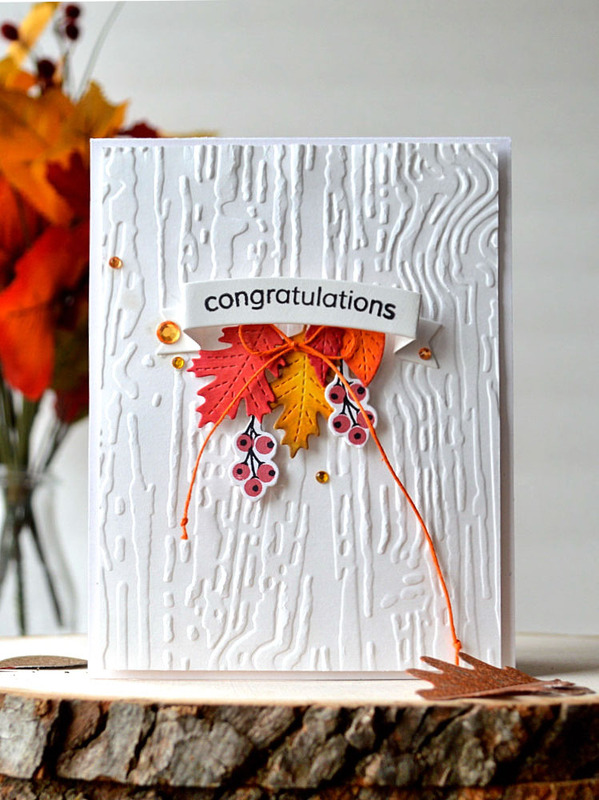 When I had the idea in my head I was thinking of my leaves dies and DCWV glitter cardstock. But when it came to making the card the glitter cardstock happened to be not such bright as I imagined. It’s rather so settled. 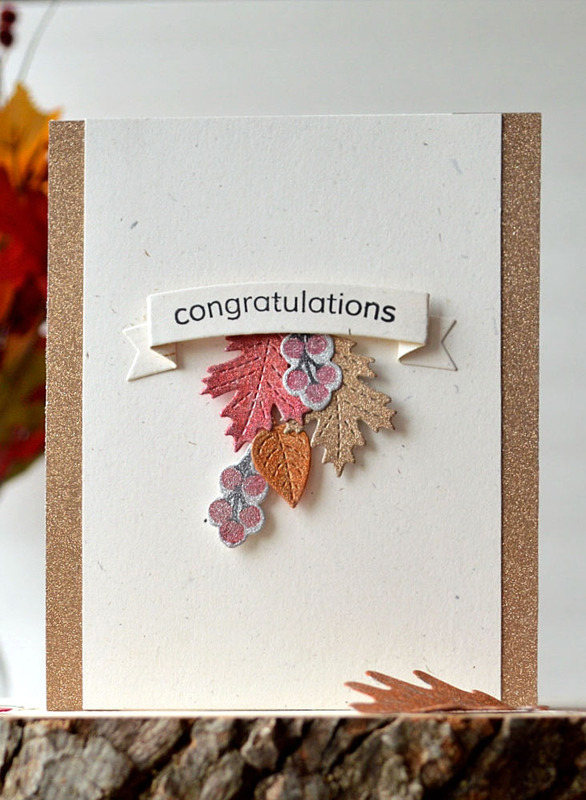 But I wanted some bright fall, so made the card above coloring die-cuts with COPICs. And for glitter ones choose less bright look (even took a rustic cardstock for this). Only one color (goldish) suited as a fall one, everything else I got coloring cardstock with COPICs (except tge berries – these are stamped). And the last card is not related for CASE Study. I did it a couple weeks ago. Nothing special. 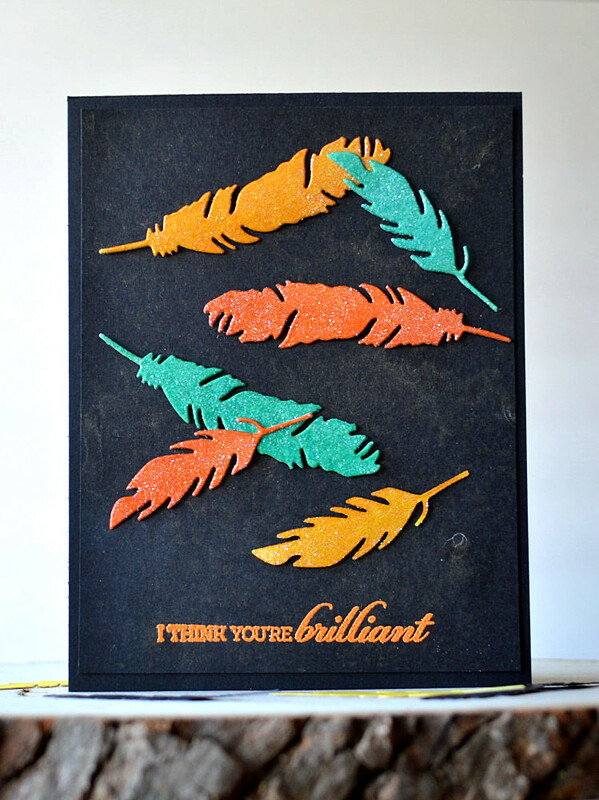 Die cut feathers, covered with sparkling clear embossing powder. Misted the black background with some biscotti perfect pearls to add some interest.